Set in one of Ashland's oldest and most desired neighborhoods. This 1931 cottage has been lovingly restored back to its original charm. Beautiful, cozy and clean; filled with art, handmade pottery, antiques and hand-crafted furnishings. Comfortable beds with fine linens and a fully equipped kitchen (complete with fresh herbs and salad mix). Beautiful yard, decks, patios and a full outdoor kitchen. Walk to everything; world class theatre (Oregon Shakespeare Festival), Lithia Park, fine dining, art galleries and shopping. We are located four blocks North of the Plaza and close to great walking and bicycle trails. 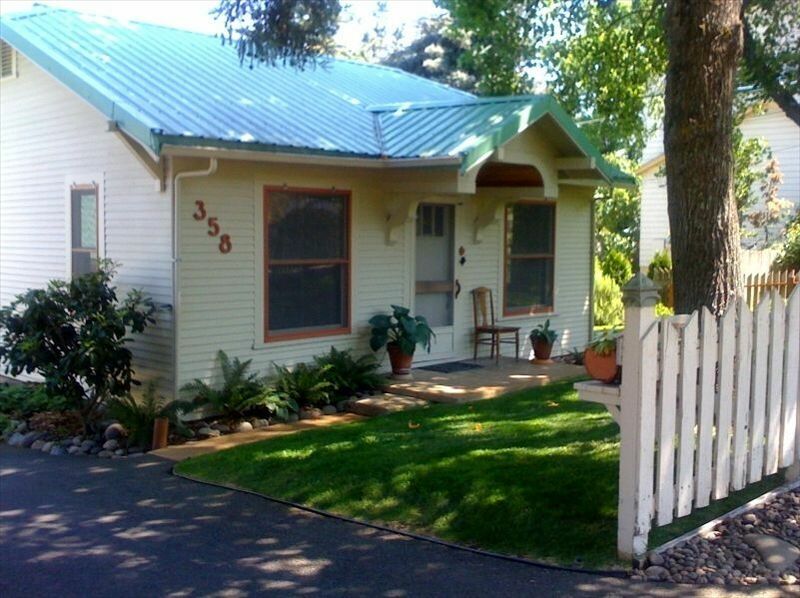 The cottage has been crafted to reflect the beauty of southern Oregon and enhance your Ashland stay. Mark and Elizabeth Schoenleber are artists (sculpture, pottery, drawing and painting) Mark taught art at Ashland High School from 1983-2013 and Elizabeth has been creating beautiful hand thrown stoneware pottery since 1988. We enjoy traveling and meeting people from all over the world. Being hosts allow us to work at home in our art studios and meet guests from all over the world. We love finding a place in our travels that exceeds our expectation and we love being able to be that for others. After the favorable response from guests in our Terra Cottage Inn (vrbo #65608) (2005), we decided to create a traveler's accommodation from our home of twenty years (2007). The High Street Cottage is a lovingly refurbished 1931 cottage that is tastefully decorated with just enough modern touches to make your stay comfortable and memorable. beyond the 'park and walk to everything' location... the High Street Cottage sits on a great piece of property. The kitchen is white tile and marble counters with an O'keefe Merit gas range, hand thrown stoneware dinner, kitchen and bake ware; set up with cooks in mind. Koi pond, Gardens (flowers, herbs, salad and vegetables (in season)), decks and patios to relax and enjoy your stay, a great laundry facility and a full outdoor kitchen. At the center of the property are our art studios and too many great amenities to list. Full Outdoor kitchen, koi pond/water feature, Gardens (flowers/vegetables/herbs). This home is efficiently equipped and beautifully decorated. It has all you could need and more. It's way nicer than it looks in the photos!! Lots of attention to detail. Another wonderful stay in the High Street Cottage, it’s our home away from home when we are in Ashland. Mark and Elizabeth are such welcoming hosts and the Cottage has everything you need. Looking forward to next year’s stay! The cottage is immaculately clean, charming and in a great location-quiet and private but near everything. How could we ever stay in a hotel again after staying at High Street Cottage? What a wonderful home away from home! Even better than home! Beautiful,yet simple, house. Amazing gardens to "pick your own" fresh salads. Fantastic areas to grill and do laundry. Very clean and bright. Great hosts and a perfect location. Walking distance to Oregon Shakespeare Festival and Lithia Park! We'll be back! We loved our time here. It’s a treat for weary souls. High Street Cottage was immaculate and comfortable. It is a great location for the Shakespeare Festival. Elizabeth and Mark are gracious, fun hosts. We loved our stay there.